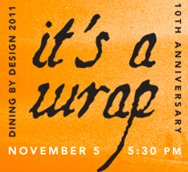 SureTech.com is proud to be a presenting sponsor of the 10th Annual Arts Council of Princeton's Dining by Design event on November 5, 2011. This unique event supports ACP's community education and outreach programs including ArtReach and Arts Exchange programs. This year’s theme, draws its inspiration from the installation projects of Christo & Jeanne Claude. Artwork by students from the Arts Council’s ArtReach and Arts Exchange programs, will be exhibited at the event. Cocktail Gala at the Johnson & Johnson Property in Skillman from 5:30 to 7:30 will be followed by dinners at private homes with an "art experience" starting at 8 pm. We hope you can join us at this lovely event.